Dryer balls are an alternative method instead of adding fabric softeners to laundry as a way to keep clothes soft and static-free. You can find a variety of dryer balls on the market. There are balls made from PVC that look like a little hedgehog to wool felted balls. Some people even swear by adding used tennis balls to each dryer load to speed drying and reduce wrinkling. If you choose a 100 percent natural wool ball as the method of softening clothes, you can avoid introducing chemical residue and fragrances to fabrics that can be harmful to sensitive skin. Making your own felted wool dryer balls is simple and a great way to use up leftover 100 percent wool yarn. You can even recycle wool sweaters that are no longer wearable. 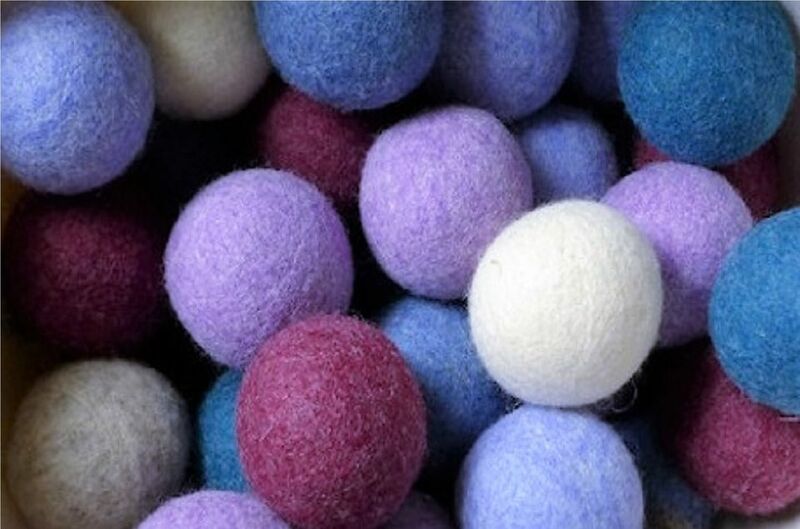 Homemade felted wool dryer balls are also much less expensive to make than to purchase. Wool dryer balls help to keep clothes separated in the dryer allowing the heated air to circulate better and dry items more quickly. The wool balls also capture static and make clothes more static-free. After a few uses, you will see pilling on the surface of the balls. This is not attractive but it will not reduce the effectiveness of the dryer balls. The fabric and yarn must be 100 percent wool or other animal hair (cashmere, alpaca) that will shrink or felt when exposed to hot water. The natural hair has barbs that latch onto each other to create a more solid finish. This will provide the density you need for the ball to hold its shape. The natural fibers also help to control static much better than synthetic fibers. If you are going to use old woven or knit wool fabrics (old coats and sweaters), cut the garment into thin strips or ribbons to begin the construction process. Wind the wool yarn or fabric strips into a ball. Start by wrapping around your fingers and be sure to switch directions often to get a ball that is equally round. Wrap tightly and in an orderly fashion until you have a ball about the size of a tennis ball, around two and one-half inches in diameter. It is best to make several balls before proceeding to the next step. Be sure to secure the end of your yarn by running it under several strands of yarn. This can be done with a large needle or a crochet hook. Some sites suggest using a tennis ball as the core and adding wool yarn or fabric around it as a quick way to make a ball. These balls will not last as long as a solid wool ball and you still have the potential problem of a release of chemicals. When the balls are the correct size, put them into an old sock or the leg of pantyhose, using the cotton string to tie off between each one. Add the filled sock or pantyhose to a pan of hot water and bring it to a boil. Once boiling, remove the pan from the heat source but allow the balls to soak until the water is cool. The hot water will cause the wool to shrink and felt. If you are using anything other than white or natural colored wool, you may see some dye transfer. Some dyed wool yarn or fabric is not colorfast. This will not be a problem when the balls are finished for use in the dryer. Next, squeeze any excess water from the balls and put the sock of balls in the dryer to dry on high heat. When dry, cut the strings between the balls and remove them from the sock or pantyhose. The balls will be smaller (due to felting) and should look fuzzy. You should be not be able to unwind them. These balls become the core of your final dryer balls. Using the ball cores, begin the wrapping process again with the wool yarn or fabric strips. Keep wrapping until the ball is around three and one-half inches in diameter. This is slightly bigger than the final product. Repeat Steps two through five until you have as many dryer balls as you want and you are finished! The balls will last for years to come.